A large utility in the Northeast United States was experiencing water in-leakage in their boiler feedwater system due to pinholes in their Stainless Steel condenser tubes. It was determined that these pinholes were located underneath deposits in the tubes, thus making the leak undetectable by off line hydro or dye testing until the deposit was removed by cleaning. These small pinholes developed due to deposits laying on the inside of the tube over a period of time. The in-leakage of the untreated river water was increasing the amount of the water treatment chemicals needed to control the feedwater system, and thereby increasing the cost. This condenser contained 15,000 Stainless Steel tubes with tube lengths of 51’. 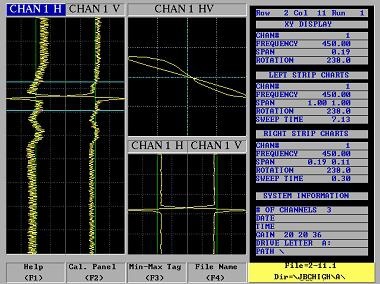 An eddy current test needed to be performed on the entire unit, however, the outage was short, and there was not enough time for a 100% inspection. TesTex utilized its Ultra Hi-Speed Eddy Current Inspection System for this inspection. This system inspects 8 tubes per minute (30’ tube lengths) and operates at inspection speeds up to 10 feet per second allowing for 100% inspection of the unit in the allotted time. Resolution and sensitivity to small flaws is excellent at these speeds, and TesTex was able to locate about 150 tubes that exhibited small thru-wall pinholes and deep partial pitting. The pinholes in these tubes were about 1 mm in diameter. The minimum ASME requirement for thru holes in tubing ¾” outer diameter and above is 1.7 mm. The TesTex condenser calibration standard uses a 1mm thru hole to obtain greater sensitivity to pitting. The Hi-Speed System is capable of detecting thru holes as small as 0.5 mm in diameter. The 15,000 51’ long tubes in this unit were inspected with two stations running 10-hour day shifts for 5 days. Prior to leaving site, TesTex provided the client with a full color tube sheet map showing all of the tubes in the condenser and their associated wall loss. The client was able to plug the problem tubes and totally eliminate the in-leakage from the condenser. The TesTex Ultra Hi-Speed Eddy Current Inspection System is capable of performing 100% condenser inspections in minimal time with a high degree of accuracy. This system has great resolution at inspection speeds up to 10 feet per second, and is capable of picking up even the smallest flaws. Full color tube sheet mapping is provided immediately after completion of the inspection. Pricing for this hi-speed inspection service is extremely competitive due to the reduction of inspection time. The client in this instance was able to complete a 100% inspection at a lower cost than in previous years. The ability to perform a complete inspection saved the customer money in lower water treatment costs and increased reliability of the condenser. Current Inspection service or other TesTex products and services, please contact us or call 412-798-8990.